The first image that springs to mind when thinking about growing pumpkins is a triffid-like vine, sprawling over everything in its path. You’d be forgiven for wanting to leave the taming of such a beast to the farmers and market gardeners who have the room to let it run, but fear not brave home grower, there is a way to domesticate the unruly pumpkin into even the smallest garden. Pumpkins are members of the Cucurbitaceae family along with zucchinis, squash, cucumbers and gourds. They are heavy feeders so choose a spot in the garden that receives full sunshine and plant into well-drained soil that has been generously enriched with compost, worm castings or any other high-quality organic fertiliser. Pumpkins are shallow rooted and have a large surface area of leaf, so require regular watering to thrive, especially during hot and windy conditions. Mulching will help to keep the soil moist while consistent watering yields the best results and helps to prevent fruit split. Keep water off the leaves when watering to lessen fungal problems. Despite being such a vigorous plant, they are frost tender, so ensure they’re not planted in the garden until the risk of frost has passed. In areas with short summers or late frosts, start seedlings indoors and then transfer out to the garden to ensure a successful crop. Firstly, choose a variety that fits the space available. If you are really limited for space, say a small balcony, then choose one of the varieties that have a bushing habit, such as the Delicata Mini Sweet, Wee B Little or the Golden Nugget. Planted into a pot that’s full of a high-quality potting mix and a bit of compost or worm casting, these three varieties will provide maximum bang for buck, while staying politely in one place. If you have a little bit more room to play with, then instead of letting your vines run out, train them up. When it comes to growing vertically, the sky really is the limit. Training your pumpkins skywards has a few advantages, most importantly, you’re getting the most efficient use of limited space, it also allows for increased airflow around the vine, which impedes disease and makes the fruit very easy to monitor and harvest. The vines will need some sort of structure to cling to and this part can be as simple or complex as you like. The easiest method is to use an existing structure such as a wire fence, a timber trellis or the railings of a sturdy balcony. An arbour, if you have one, makes for a very attractive structure for growing pumpkins as the ripening fruit hang tantalisingly below the leafy canopy. If you don’t have that luxury, then a simple trellis can be made by driving in sturdy stakes at 1.5m intervals and then using some old hinge joint, chicken wire or reo mesh to provide the climbing structure. When the vine starts to grow, gently train the tendrils onto whatever structure you’re using, they should grip by themselves but if they don’t give them a hand with some plant ties. The beauty of using smaller varieties is that the vine can usually support the fruit as it grows, though if they start to get a little heavy, support the fruit with old stockings or any other light material that will dry quickly when wet. All members of the Cucurbitaceae family can trace their history back to prehistoric Mesoamerica, with experts estimating the family has been domesticated and cultivated for at least 7000 years, pre-dating the domestication of maize. It’s believed that the journeys of Christopher Columbus first brought pumpkin seeds back to Europe, though these varieties were a far cry from the pumpkins that we know today, being more like a hook-necked gourd. European farmers selectively bred pumpkins, transforming them into the shapes and flavours that we know today. The Musquée de Provence (pronounded 'moo-skay) first appeared in the Vilmorin seed catalogue in 1890, where it was listed as ‘Potiron Bronze de Montlhery’. It remains a popular variety for market growers to this day because of its stunning appearance and delicious flesh. The name Musquée de Provence roughly translates to Musk of Provence, perhaps in reference to the rich aroma of its roasting flesh. 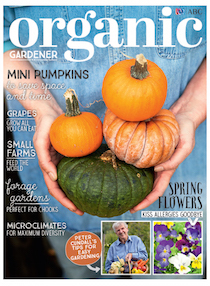 For the full story on growing mini pumpkins, including eight different varieties to try, and pest and disease control, get the latest issue of ABC Organic Gardener magazine OUT NOW!